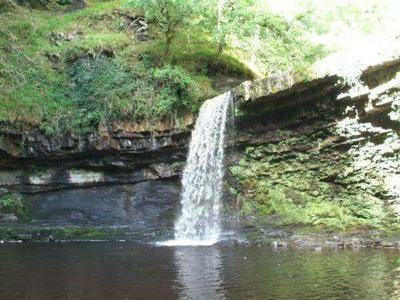 Set in South Wales in the Brecon Beacons National Park and the Forest Fawr Geopark, the Vale of Neath has become known as Waterfall Country. There are many waterfalls in this relatively small area, and maps and information on visiting them can be obtained from the Waterfalls Visitor Centre in the village of Pontneddfechan. From the Waterfall Centre the well made path follows the riverbank for 1.3miles, through ancient woodland to Sgwd Gwladus (The Lady Fall). 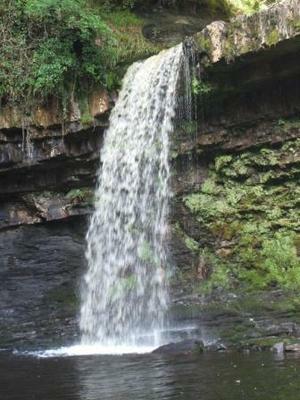 The fall is named after Gwladus one of the 25 daughters of the 5th century prince Brychan. She fell in love with Einon whom her father would not allow her to marry and her sad spirit is said to flow in this elegant 20ft fall. The river spills over a sandstone rock lip, which reminded us of falls we had seen in Hawaii. A scramble up the hillside allows you to walk to the edge of the lip. 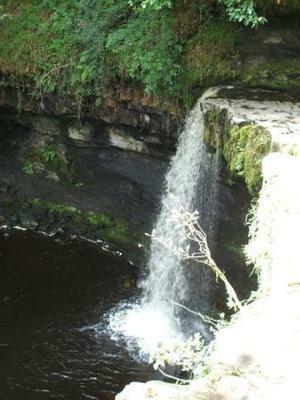 Further upstream is a much taller waterfall named Sgwd Einon after Gwladus’s love. We did not get to this fall as there is no path through the steep sided ravine to view it and the river has to be forded several times.